Is from the Christmas solutions cartridge. I really like the cut but there was one problem. I did have to hand cut an extra holly leaf otherwise it would have looked funny. The hand cut one is the one on the bottom left hand corner of the sentiment. I used some red stickles on the berries and then used Glistening Snow Writer on the berries and leaves to add accent. The sentiment is computer generated. I did like the new hide contour feature on DS because it allowed me to get rid of cuts I didn't want, such has getting rid of the note card when I was cutting the holly leaves and vice versa. How adorable... I didn't see a .cut file. but it is so cute. 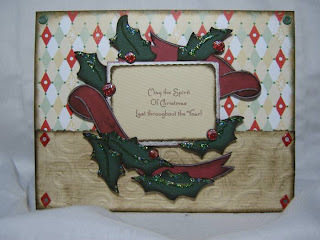 thanks for sharing..
What a GORGEOUS card! I love how the holly makes a circle around the sentiment. VERY nice! Love the card! What font did you use? Where did you get it? ?